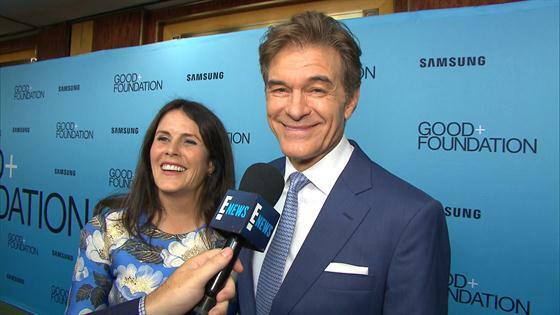 An apple a day won't keep Dr. Mehmet Oz away, or from getting your People's Choice Awards vote! As our first round of voting gets closer to ending—your votes count as double from now until Friday at 11:59 p.m. ET—celebrities are still working hard on their campaign for the 2018 E! People's Choice Awards. The best example of this is Dr. Oz whose show is nominated for Daytime Talk Show of 2018. While attending the GOOD+ Foundation "An Evening Of Comedy + Music" Benefit presented by Samsung Electronics America on Wednesday, E! News caught up with the TV personality he couldn't wait to tell us why his show deserves your PCAs vote. "I'm blessed to be nominated for a People's Choice Award, I think because people respect that I speak to them honestly about things that are hard to talk about,' Dr. Oz told E! News on the carpet. "I make it accessible and I empower people to change their lives and become the world experts on their bodies." If helping people isn't reason enough to vote for The Dr. Oz Show there is another promise that the show's host made that might entice you to cast your ballot for his daytime talk show over his competitors...money. "If you're saving the lives, I think like it's worth a little bump. Just a little notch," he continued. "Plus, I'll pay cash." Sadly, Dr. Oz was joking about the cash promise in his campaign and quickly cleared it up saying, "I can't, they won't let me. I tried." Even though cash money would be a fun reward for voting, Dr. Oz does help people, so that is reason enough for us to give his show a little love ahead of the PCAs. To vote for The Dr. Oz Show, or any show for that matter, click here. Voting for round one of the 2018 E! People's Choice Awards ends on Friday, Sept. 14 at 11:59 p.m. ET.